Google Mayday Update: Fair and Balanced? Near the end of May, Google released an update to their search algorithm-dubbed “Mayday” by most-that affects natural search engine rankings, especially for what are known as “long-tail keywords“. In looking at this Mayday update, we will ask the question: Are these Google updates “fair and balanced“? The Mayday Update: What Happened? As you know, Google frequently updates their algorithm to improve search results. The Mayday update carries with a significant change for how Google returns search results for “long tail keywords”. In the past, a page that was optimized for this long tail term might win the battle. Here is how this would be accomplished: The SEO optimizer would create a page with that exact name and he or she would sprinkle the long-tail keyword liberally throughout the article (which would probably be filled with non-original content). They would then create several inbound links using this exact long-tail keyword as the anchor text. The goal with a page like this would be to attract visitors looking for iPod reviews and then have an affiliate link through which the visitor would then buy an iPod. Ideal Result: This page would rank above a site with better, more original content and, most importantly, earn money! The Google Mayday update is designed to prevent someone from easily leveraging a long-tail keyword like this. As you can see, all “above the fold” results (what you see without having to scroll down) are authority websites such as Amazon.com and Cnet.com. Google Mayday Update: Is it Fair and Balanced? As many people are found on the edge of the sinking ship yelling “Mayday”, let’s ask the question: Is this Google Mayday update fair to the SEO practitioner? Is Google putting SEO specialists in an untenable position? Though the Google Mayday update disconcerts many in the SEO circles, it is certainly fair. In the example above, would you rather see a suspect site with duplicate content about iPods or a great, legitimate site such as Cnet.com? As an SEO practitioner, you do not want to abandon the idea of long-tail search terms. You simply want to make sure that the resulting pages are a great match for the searcher with highly relevant and quality information. 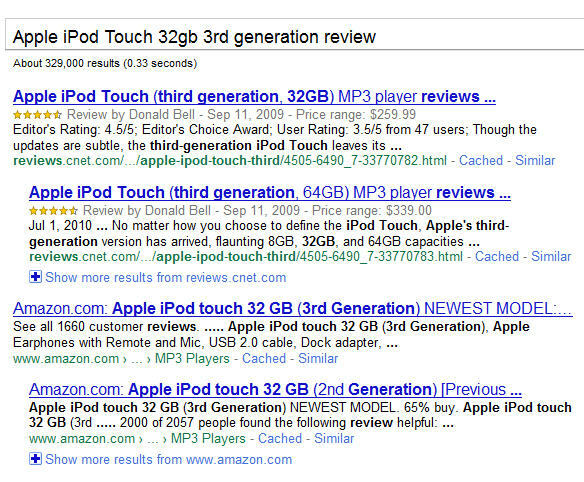 And no, your Amazon rip-off product page, no matter how much you “reword it”, is not a worthy of high results. Google must provide the best results and is doing everything that they can to accomplish this. The fact is that Google still makes 80% of their revenue from search engine results. All of the other cool Google stuff-can you say Google Earth?– is funded through the monies generated by their search engine. If Google ever loses the search engine battle, they will be the ones yelling Mayday! Wordtracker vs. Google Keyword Tool: Which is better for keyword research? Richard CummingsGoogle Mayday Update: Fair and Balanced?